This chapter attempts to investigate the effect of military expenditure on FDI inflows in the 15 emerging market economies over the year 2002 to 2015. Military expenditure takes away scarce public resources, which could have been used for the development of crucial physical and social infrastructure leads to have a negative impact on FDI inflows. The authors have followed both the static and dynamic panel data methodology along with other relevant macroeconomic variables for this exercise. They have found from their analysis that military expenditure is statistically significant on FDI inflows in emerging economies over the year 2002 to 2015. The authors have also examined the relationship between military spending and FDI inflows in the context of economic growth across the emerging economies during the period 2002 to 2014. It has also been found that the military expenditure has a significant impact on FDI inflows in special reference to BRICS countries. Foreign Direct Investment (FDI) contributes to the development in emerging countries. It leads to creates employment opportunities and employment of new technology in production to the emerging market economies1.International investment is generally two types like foreign direct investment (FDI) and foreign portfolio investment (FPI). FDI is the amount of international investment that may take the form of buying or constructing a factory in foreign countries. Generally, in order to long term interest the aims of a direct investor are to gain an effective voice in managing the firm, sharing the profits, and directing the operations of the particular business in the host countries. On the other hand, Foreign Portfolio Investment (FPI) is a category of investment, which occurs in equity instruments (stocks), or debt (bonds) or share in order to obtain short-term interest. Infrastructure, knowledge and investment in productive assets are prerequisite for economic growth and sustainable development in developing countries. In that context, FDI plays important role in financing and development in the emerging countries. Apart from economic infrastructure in terms of skill of infrastructure, governance now plays a determining role for inviting FDI inflows. Besides such factors FDI inflows in each emerging country depends on military expenditure because defense sectors protect the countries from foreign attacks and control corruption. Therefore, foreign investors attract to invest in the emerging countries when the host countries are politically stable, corruption absence and positive economic growth. In Benoit’s (1973) analysis there, has been positive relationship between military spending and economic growth. On the other defense sector has enormous prospectus like creating employment opportunities, export weapons to foreign economies. Therefore, defense expenditure works as positive catalyst to economic growth in emerging economies (Smyth & Narayan, 2009). In case of investment in defense dependent on import of arms from other countries, it has negative effects on economic growth (Pesaran et al., 2001). The end of cold war each country reduced their expenditure on defense and increased their expenditure on non-military sector such as education, health etc. However, the need for security still causes governments to spend an important portion of their national budget on defense expenditures. Early in the post-Cold War period, the trend of global defense budget is slackening but after the 21st century era, it started rising continually (Stockholm International Peace Research Institute (SIPI) 4 Military Expenditure Database, 2015). Therefore, today is the defense expenditures being one of the main concerns to many emerging countries because the defense sector forms a crucial part of countries’ budgets. It is important that defense expenditure related with the security of the country, but it might affect GDP growth and GDP growth also an important factor of FDI inflows to the foreign investors. According to Keynes, defense expenditure has a positive impact on economic growth by stimulating aggregate demand, rising capital stock utilization, employment, and profit. However, in neoclassical views it is argues that defense spending negatively affects to economic growth, through channeling resources, which may be more productive in the private sector, to defense and related sectors. This will lead to further effect such as increase in interest rate and if government wants to finance the budget constraint by increased borrowing, it will increase the government debt. As increasing government debt leads to negative economic growth and it has been adversely affects to the FDI inflows. Therefore, foreign investors are less attractive to invest in the emerging countries because high military expenditure indicates that the countries spending less on growth and development process. In that case, foreign investors will not invest their money in those countries. The consequences are it will affect economic growth, as FDI is a main engine for growth to the developing countries. Emerging Economies: The emerging market economy the term was originally coined by Antoine W. Van Agtmoel of the International Finance Corporation of the World Bank – the emerging economy is defined as an economy with low to middle per capita income and it constitutes 80 percent of the global population and represents about 20 percent of the world economies. 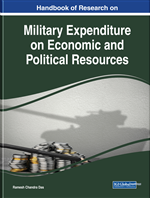 Military Expenditure: Military expenditure is also known as defense budget of any countries. It is amount of finance by nation to maintaining an armed forces or other methods essential for defense purposes. FDI Inflows: Foreign direct investment inflows are the inward direct investment made by nonresident investors to the reporting countries. FDI is the sum of equity capital, other long-term capital, and short-term capital as shown the balance of payments. FDI usually involves participation in management, joint venture, transfer of technology and expertise. FDI plays important role in financing and development in the emerging countries. WuHausman Test: In order to decide whether fixed effect model or the random effect model is suitable, we consider the Wu Hausman test. The Wu Housman specification test compares the fixed effect and random effect model and it thus decides which model will be follow in our analysis. The null hypothesis of the test states that the random effect model is true. If the value of Hausman test statistic is large, the difference between estimates is significant, so null hypothesis that random effect model is consistent and it is rejected then the fixed effect estimators are used. If the value of Hausman test statistics is small, then random effect estimators is more appropriate. Control of Corruption: Control of Corruption means that the public power or bureaucratic regulation exercised for private gain from which it creates corruption in the country and which may hinder for the foreign investors. Massive corruption leads to inefficient plans for the foreign party due to uncertainty and ambiguity creates in return. It is a governance indicator which defined by World Bank. Static Panel Model: Panel data are multi-dimensional data involving measurements over time. Panel data contain observations of multiple phenomena obtained over multiple time periods for the same firms or individuals. This study is carried out by static panel data analysis under fixed effect model. Static Panel data analysis considers time series data and cross-sectional data simultaneously. There are two type approaches for static panel data models variation such as fixed effects and random effects. In the fixed effects approached, some unobservable variables correlated with the explanatory variables.